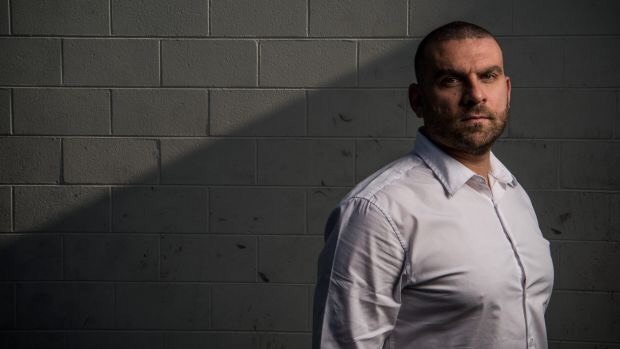 An ex-Bankstown police officer whose seen violence, crime, corruption, and discrimination, Danny Mikati is hardy and resilient. He’s here to show us that there’s a greater plan out there, and your mindset is what’ll get you through inevitable hardships. [laughs] Could you introduce yourself? Yep, my name is Danny Mikati. [laughs] Okay, no worries. Um, so I’m 41. Just turned 41. Born here, my parents migrated from Lebanon in the early ‘70s. Okay, so you said you were born here. Which area were you born in? I was born in the illustrious Bankstown Hospital, and never really left the area. So, um, still worked and lived here. Okay, amazing. Could you describe the place where you spent your childhood, and can you remember one significant memory? Geez. Um, I spent my childhood on the streets of Lakemba, and I had a very, very active childhood. I’m the eldest of two brothers. And, um, I suppose a significant memory would be that I hurt myself and almost killed myself once. That would probably be a significant memory in my mind [laughs]. I don’t know if that’s what you are after! I bet you won’t forget that! So I went and thought, ‘I need to grab myself a snorkel’. So I went and got a ruler. Um, put the ruler in my mouth, and pretended I was swimming over the couch over the sofa. And then I slipped and fell over the sofa and the ruler went straight through my mouth, out my throat, and broke. Luckily it broke inside my mouth and didn’t come out the other side. And I spent the rest of the next week in hospital. Definitely. Definitely you won’t forget that. Yeah I definitely remember that. So I never put rulers in my mouth [laughs]. Yep. So where did your dad work, just out of curiosity? My dad at the time was working for the government as a bus driver. But he was doing two jobs, he was also a taxi driver on the weekends. I believe he was a bus driver for that shift at the time. Dad actually still is a bus driver for a different company now. But he’s going strong in his 60s and thus still working. But yeah. You said you never really left the area, so you were living in Lakemba? Born in Bankstown, lived in Lakemba, where do you live now? So I still live in the Bankstown area at the moment. I moved out of Lakemba to Greenacre, and had my high school years while I was growing up in Greenacre. And then after I got married I came back to the Bankstown area, and that’s where I worked. Beautiful. How do you feel about the area you live in? Oh look, it’s definitely changed over the years. Went through a pretty bad patch back in the, um, probably early 2000s – late 1990s. Thankfully it’s a lot better now. Look, I love my area, it’s the hub of the community and that’s my lifeblood, so yeah. I have nothing but mainly fond memories. Okay. You said you live here and work here, what did you work as? Or where do you work now? So I was a police officer for 17 years. I graduated from the Police Academy in early 2000. My first shift was actually escorting the Olympic Torch in Bankstown in 2000. That was my first job, yeah. Yeah [laughs] [laughs] And I stayed at Bankstown for probably, let’s see, probably 12 years straight pretty much. Even out there doing different duties, but mainly I was at Bankstown doing domestic violence and child protection. That was what I specialised in, and a whole bunch of community work. And then I worked for the southwest metropolitan, so the entire southwest bit. I did that region for about two years, then got promoted to sergeant and moved to Campsie and worked there for three years before I resigned. Okay. So you said before that the area wasn’t always the nicest in the early 2000s, and that’s actually when you started as a police officer. So could you tell me a bit about how your job was at the start? Did you struggle, was it good? Because the relationship between Arabs and police, you know, isn’t always the best. So how did that work as an Arab police officer? Yeah, so when I joined at the Academy, I was the only person in the Academy who asked for Bankstown. So obviously I got it, which was quite funny. And I think our class had about 600 recruits in it, and so I was the only one that picked Bankstown. I believe probably Bankstown picked me, to be honest with you [laughs]. So at the time in early 2000, Bankstown was the murder capital of the country, the stolen motor vehicle capital of the country, and we were in the top 5 for every violent category you could think of. So it was a lot of high volume crime, and a lot of high violence crime. The saying was back in the day, that if you wanted your car stolen just park it at — in those days it was Bankstown Square, now it’s Bankstown Centro. For many, many, many years there were no real proper security measures at the carpark, and that’s the most common place in the whole country to get your car stolen. That was during the early 2000s. Yeah. I saw a murder on my third day as a cop. Actually saw it happen. And basically was helping give first aid to someone who pretty much died in my hands. So that was a hell of a start to the career. I then went and responded to at least five murders within probably a month, after that. Yeah, it was a pretty intense time for the area. And for yourself, as a starting officer, how did you feel — Okay, original question. Were you the only Arab police officer at the station at the time? When I started there was one other officer of my background, but he quickly — probably within a couple of months — moved to the country. So then it was just me for awhile. Initially the community didn’t know who I was, and I didn’t really look as ethnic as now [laughs]. Before I looked a lot less ethnic, so people couldn’t pick it. My surname wasn’t known, so unless you had people that were my parents’ Lebanese background that knew [Miqati] was a politician and a pretty well known family that had my surname, nobody else would know. Cos we were the only Miqatis in Australia at the time. It was a difficult adjustment because there was — because I’d been raised in the area and gone to school in the area, I wasn’t used to racism. So, if anything, everywhere I went we were the majority. Going into the workforce, it took a bit of time for it to sink in that I was actually being the subject of some discrimination and some racial taunting and that kind of stuff. And there was an underlying sentiment of mistrust towards me because of my background. I can go into an example of that if you like. So as a recruit, when you first start as a probationary constable you get given the not-so-glamorous jobs. Like washing the car, checking for petrol, oil levels, brakes, all that kind of stuff. So every shift I’d be working with a partner who was higher ranked than I was, and I’d have to go and fill out a checklist of the car. And I started to pick out a trend that every time I’d be cleaning or checking the car, there’d be money in it. Alright. So first it was twenty dollars here, fifty dollars there, but every single time. There was never once I checked a car that didn’t have some money somewhere. I didn’t think too much of it until it was like maybe, you know, my eighth or ninth car in a row, and I spoke to one of the police officers I had a rapport with. And I go, ‘What’s with these cops always dropping money?’ He looked at me and he sort of frowned, and I go, ‘What’s wrong?’ And he says, ‘They’re not dropping money, they’re testing you. That’s what they call integrity testing, to see if you’ll take the money’. And I was super offended, and I thought, ‘Wow, they’re trying to buy me with twenty bucks, how low do they think I am?’ I got pretty upset about it, but I thought, you know, I’ll toughen up. I could see what the officers were coming across in people within my community, I had a window into the crime world and what was happening within the walls of our community. It was pretty horrific, and it wasn’t a very nice indictment on who we stood for. So I tried to rationalise it in my brain, like, ‘Look, this is what they see. They only see the worst of the worst’. I found out there was an officer of similar background, not the same faith, that had been thrown out prior to me coming on corruption investigations. So I thought that’s probably not doing me any favours either. So I tried to just grin and bear it, but not too long after, a lady walked in while I was on station duty. She had a Hungry Jacks bag and she just dropped it on the counter and pretty much ran out. Now I thought it was a bomb, you know, so I hit the deck. I got up and realised that there’s no one else in the station, which never happens at Bankstown. I was the only cop inside that whole sort of three metre radius, and I thought, ‘What the hell is going on?’ Opened the bag, and it was full of cash. Just tens of thousands of dollars. And I thought, ‘They can’t be serious’. I went back to the office and typed up my resignation and thought, ‘You know what screw this. They don’t want me, I don’t want them, I’m out’. Something made me hold onto it, I didn’t submit it. It was the end of the week, I remember that day. It was a Thursday, definitely a Thursday, because Friday I remember I had to go to the mosque. So I went to the mosque in Lakemba on Friday morning, and at the time the President of the Lebanese Muslim Association saw me and said, ‘Hey, how’s the cops, how’s it going?’. And I said, ‘Crap’, and he went, ‘What? Come to my office’, and I went upstairs and sat with him and told him what happened. And I go to him, ‘I’m out’, and he grabbed my hand and he goes, ‘You’re not going anywhere. You have to stay doing what you’re doing. You don’t know this, but a lot of people are telling us about the work you’re doing. We know what you do after hours, we know they’re coming to you, we know that you’re seeing these mothers whose sons are in jail’, and all this kind of stuff. I couldn’t believe it that word had spread, I had no idea. And he goes, ‘You were in this job for a reason, there’s no one at the moment doing what you’re doing. This is a higher responsibility than just what you wanna do’. I felt like crap and I went, ‘Oh okay’, and I tore up my resignation and continued. Yeah. That’s actually amazing. So you said a little bit about how the President told you how people are starting to find out about you and the work you were doing. Do you know how the community reacted, or do you know any community reactions when they found out that you were working as a police officer? Yeah, uh, look I did a Telopea Street raid in the very early part of my career. It would’ve been the first few months, and it was a massive raid and went all over the news. Was that the really big one? The really big one, yeah. There were lots of drugs and guns found and it was a massive operation. Um, and I remember feeling very uncomfortable because a couple of people went to school with me that were on that street. And I thought, ‘I don’t wanna be here, this is not gonna be good’. You know, and they’re speaking in Arabic and I can understand, so then I — it’s not like I’m suspecting these guys are guilty, I now know they definitely are, and I’m hearing everything that they’re communicating to each other, and I’m like, ‘Wow, this is just terrible’. These are guys I played handball with, you know, and look at the career path they’ve taken. Um, so one of them spotted me, only because one of the officers called me out to come and help her with something so they heard my name. And so this guy who actually went to school with me for many years, he’s the one that spotted me, and he told everybody. You know, and that’s the first time that I’ve been called a dog. And I was like, ‘Wow, but what did I do?’ [laughs] I found it strange, like, who am I betraying? You’re poisoning our kids with your drugs, you’re robbing, you’re shooting people, you’re stabbing people, but I’m the dog. How does that work? Like it didn’t make sense to me, you know. I was very naive to the community in my first years, like, I didn’t really understand that kind of sentiment. Um, and so the first time I thought to myself, ‘You know, there’s a bit of a danger here, this may not end well for me’ [laughs]. But it seemed to me that the community had been sort of crying out for a bit of a conduit so that people could understand their position. I mean, when I started to do what we call a death message — so, whenever someone passes away it’s usually the police that tell you, you know, a loved one has passed away. And because of my background, I started getting all the ones from our community, which was horrendous. That’s not what I wanna do. I don’t wanna go to a lady and tell her that her son died because of this or that. And it got pretty bad because then there was, like, sort of this moral contradiction about going to, say, a Muslim household where the son had taken drugs and fallen off a bridge cos he thought he was superman. How am I gonna tell the mum that that’s what his last act was before he passed away, you know what I’m saying? That was really tough, like, I started to struggle with that, ‘How do I make it an easier pill to swallow?’ and all that kind of stuff. But I think just sharing in their grief gave us a bit more of a connection, I really spent a lot of time with parents cos I could identify with what my parents would go through if that was someone like me doing that. Um, and I think that made things a lot easier for me, and I genuinely felt what they felt. So it wasn’t hard for me to link and identify with the community, so I think that made it easier for the acceptance. When people started working out, ‘Hey, this could be a pretty big advantage’, if they took advantage of it in the right way. Thank you. Did you always imagine yourself as a police officer? Nah, when I was in high school I wanted to be a doctor. Since I was in Year 5 or Year 4, I wanted to be a doctor. And everyone who ever knew me was like, ‘Danny’s gonna be a doctor, Danny’s gonna be a doctor’. I write like a doctor, you know [laughs]. I’m left handed which doesn’t help, my writing style is terrible. But I did pretty good at school and when I got to Year 11 – Year 12 I started to think, ‘I don’t think I’ll be able to get into Medicine, there’s no way I’m getting 99%’. You know, I was just being realistic. So I thought, you know what, I’ll do my science degree if I can get into science, and just sit the GAMSAT exam and go into medicine from there. So even in Year 12 this is what I was thinking I was going to be doing. One time only — this is interesting — I was in Year 7, I sat with a peer leader, he was Year 11. So they connected us, which you know, I think they still do that now. And he wanted to be a police officer, I remember him saying. And I said, ‘Oh, what do you need to get for that?’ and he goes, ‘Oh you just have to have good English’. I’m thinking to myself, ‘I’ve got pretty good English, I wonder if I could be cop’. You know, but that was the only time ever that police appealed to me in the back of my mind, but I’d never thought of it. Because I had no one I knew who was in the community that was a police officer, you know, so at the time it was all about medicine. And I got into science, I quickly worked out I’m the kind of guy that gets bored very quickly, and I couldn’t see myself doing lab work and I couldn’t wait to finish the science degree, let alone do another degree after it. So when I was probably 85% of the way through my degree, I got engaged and I took my wife to a careers advisor at TAFE, who ended up being one of my old high school teachers. So he forgets about her stuff and is talking about me, ‘What are you doing now?’. I told him and he goes, ‘Are you happy?’ and I say, ‘To be honest, I’m not. I don’t really wanna do another five years of study after this degree. I don’t think I’m going to get enough marks to be so competitive that I’ll get straight in. And the science realm for me, in terms of testing and lab work, it’s not me, I get too bored. I can’t see myself doing that’. And he said to me, ‘What about forensics?’, and I go, ‘Oh yeah, forensics sounds alright’. He goes, ‘Why don’t you do it with the police? They’re running a scholarship right now, if you’ve got a degree in anything you can jump into the police force express programme, and then you can get into the forensics side within the police force, cos they’re crying out for scientists internally. And crime scene investigators’. And I thought, ‘Yeah that sounds alright’. So, much to my parents’ dismay, I put my application in for the scholarship and I got it. And off I went to Goulburn. Wow that’s so interesting. So you said you retired in 2017, how long were you a cop for? Just over 17 years, yeah. What made you finally resign? Because it sounds like you really did love it at some point, cos you did so much. Yeah look, I loved and hated it every day. There were patches where it was a lot more negative than it was positive, for many reasons. I suppose as my family got bigger, you know, when I went from one child to three, the financial constraints were getting harder. It’s getting harder to live in Sydney, as you can imagine, and my wife wasn’t working. My wife stayed home and looked after the kids, she never went back to work so it was just my income. And I remember for the past four or five years before I resigned, thinking, ‘I need some way to get a bit more money so I can make sure these kids have everything’. Cos you wanna give your kids everything, you know? I think my dad sort of inbuilt that into me, so. Do I take on a second job? But I was already doing a lot of extracurricular activities, I’ve always been very heavy on the charity scene and still am. And so I did not wanna compromise that, that was really important to me. So where am I gonna find time for family, charity, and work, and then find another job? The only thing I could think of is if I get promoted. What’s funny is, the police is — if you go from what they call a leading senior constable, which is what I was, it was a specialist rank. And then get promoted to a sergeant, you’ve gotta wait three years for your money to catch up cos you actually get a pay cut. So you go up in rank, but lower in money. Yeah, it’s the stupidest thing ever, which is why I did not pursue a promotion earlier. I took my time, and I had reasons for why I didn’t want to be promoted. So even that period of those three years on less money, I felt it. Like I really felt it. I remember thinking to myself, ‘I’m gonna have to start looking for an exit strategy’, but I just didn’t know what that was. Well, when you’ve been sort of institutionalised in terms of the way you work, working for the government, you kind of think you can’t do anything else. Which is funny. I was so wrong, let me tell you. I was so wrong. And it’s amazing what comes out of that and where it gets you. It’s the things that you don’t expect that will lead you to clearer and better horizons. Yep, 100%. So what do you do now? So, as of September last year, I opened my business for the first time. I’d always wanted to be a consultant and spoke about that or many years. I thought, you know, giving the benefit of my experience in certain areas I could probably do consulting and then finally took the plunge. So yeah, September last year — a job I had, I got headhunted for a position and that’s what made me finally jump the police force. I got offered a CEO role with an organisation at a much better financial side, and even the conditions itself and the freedom, I remember talking to the owner of the company that ended up hiring me. He gave me what the package is and he goes, ‘What else? What is something you really want?’. I go, ‘I want freedom. I’m over making other people look good. Not getting the benefit for my hard work. And when things go wrong, even if I’d advised not to do that, I’d have to fix their mistakes’. I got sick of all that stuff. I go, ‘I don’t ever wanna be asked, where are you and what are you doing? Let my results speak for themselves, you tell me what you want and I’ll get the job done’. And he said, ‘You know, that’s the reason I’m giving it to you. No problem, what else?’ I go, ‘I don’t work in Ramadan’. He goes, ‘Okay, done, as long as the work is done I don’t care’. I went, alright, this is my dream job, I’m taking this job. So I took it, and unfortunately within two months the mistakes of previous management had bled the company heavily, and the owners were not prepared to put any more money into the company and unfortunately 30 people lost their job, including myself. So I was forced with the prospect of now what do I do? I was gonna be unemployed for the first time since I was a kid. So I thought, you know what, maybe God’s telling me something. That night I jumped online and created my own company. Amazing. So you’re a consultant? And could you tell us a little bit about that? Yeah, so being a consultant is pretty cool, you get to claim that you’re a specialist in whatever the hell it is, you know [laughs]. Until someone can see if there’s any weaknesses in your knowledge. But basically what I chose to be a subject matter expert or a consultant in, is the stuff I was always very passionate about at work, and where I spent most of my time and my networks, so the community services sector, children, and sort of the out-of-home care realm, so what we call foster care. Ah, so the director of a local company here in Bankstown, who looks after foster care and other things, she remembered me from when I worked in child protection. Had a coffee with me, she goes, ‘Hey can you do blah blah blah?’ And I thought, ‘Yeah okay’. She goes, ‘I’ll show you some examples’. I looked at it and thought, yeah I could do that. Sent me on my first job, and X amount of months later now I haven’t stopped. It’s been one after the other, so now I get to — I’m extremely lucky, I get to be the one who interviews prospective foster carers and assess their ability to take on children. I get to speak to the children themselves, see what their needs are and match them up with the right person. I do their complex investigations, I look after their safety, it’s amazing. I’m so lucky. I also deliver the training to foster carers on certain behaviours, you know cyber bullying, cyber safety, anything that they’re basically struggling with I’ll get involved on that end. I do some leadership training for the staff as well, so out of all the contracts I’ve got, that’s my favourite. I really love that space, it’s just the most rewarding work ever. Yeah, that sounds amazing, and I can hear it in your voice that it just sounds exciting to you. It is, it’s really, really good. Um, so it sounds like you’ve been through some tough times and some equally as amazing times. Can you tell me, not just as a community leader and a voice for the community, but just personally. What does strength mean to you? Look, I think strength in the term that we’re probably referring to it is closely aligned with resilience. There was — every obstacle I believe was a destiny alignment point if that makes sense. So I’d trip over so that I could fall in that area, and oh man did I fall over [laughs]. It was just a litany of barriers throughout the journey, but I don’t regret any of it. Every single one of them got me to where I am. And I can see why certain relationships flourished, other relationships ended, and at the time they don’t make sense to you. Like, what is wrong with people? Someone that you literally saved their life would then turn on you, like, are you nuts? And then you realise, ‘Oh thank god I’m not still with that person cos they would’ve taken me to this path and I don’t wanna do that, and now look where I am’. So I think the strength is, number one, being able to withstand the barrage at the time. But more importantly, being able to reflect on it later and become the motivator to continue for the next one. Beautiful answer. In saying that, what is the hardest thing you’ve had to overcome and how did you turn that experience into strength? Look, I suppose loss of people that were close to me in my life. I’m very lucky that no very-direct family members have passed away, thank God. But I’ve had people that were quite important to me pass away, and it kinda happened now, in later life. And I suppose that definitely shook me, cos it came at times where I was kind of cruising in life and going pretty well, and it just came out of nowhere and just dropped the anchor. And they were very difficult times, and I think there was also times in my career where unfounded complaints came out, and people that were very dirty were given these voices to raw, and nobody was interested in what I had to say. I think that was extremely frustrating, but very disappointing cos the police complaint system is abysmal. You’re guilty until proven innocent. And it’s not what you’ve done, it’s who you know. And it’s rampant with that crap. There was a time where a complaint was put on me, cos I wasn’t prepared to be corrupt with this guy. That annoyed the hell out of me and it stopped a promotion for me, it delayed it significantly. And I was pretty upset, I think that’s the first time I probably experienced a bit of depression, a bit of long term anxiety. And then that became the greatest opportunity I ever had in my career. I got to work undercover for the first time. I got all these awards for locking up people that had been abusing children, it was just the most rewarding work ever. And I never would have got it if I hadn’t gotten that complaint. It was interesting cos I had a position, and they had to remove me from this position while they were investigating the complaint. By removing me from that position, a supervisor who knew me and who trusted me and believed my story said, ‘I want you to work for me’. And so the Commander at the time was also very supportive of me, and we won in the end which was great, but it took a long time. He put me in there and I was able to just be creative and try different things, and that was the happiest part of my career for a very long time. Like, I loved doing what I was doing. I had a small team working with me, as soon as I got cleared I was double promoted, you know? And it was just like, ‘Wow’. The skies just opened, it was just amazing. So I no longer look back on that with resentment, instead I’m very happy that happened. There’s no other way I would’ve left that position if I didn’t get a complaint, it’s just amazing. It was just meant to be. Yeah, that sounds really good. So as a community leader, and from your personal experiences, what advice can you give to people who might be going through something like that? So, like, that hardship? Look, number one, I think the term ‘community leader’ is a difficult one. Um, an ex-colleague of mine used to name it ‘people of influence’ as opposed to community leadership. Because we would sit there and basically cynically say, ‘I don’t think we’ve got any community leaders’. Because I think leadership has a lot to do with succession planning, and our leaders don’t seem to do that very well, hence why they stay in the same position for 15, 20 years. So a good leader to me is someone who breeds leaders, and if you’re not doing that, I don’t think you can hold that term. Now, I think… you know, putting humility aside and being realistic about it, if I reflect on achievements I’ve had, I think my favourite achievement is the mentoring I’ve had of what I believe are now community leaders. So, youth that I’ve had the privilege of being able to give the benefit of my experiences to guide them a bit in certain aspects of life and now they’ve become successful in their own right. That’s more an honour and a privilege as opposed to ‘that’s a feather in my cap’, if you know what I mean. So I think that’s, yeah, I’m not entirely comfortable with the term community leader, but I think I’d love to be a community mentor. If that makes sense. [laughs] What advice can you give to people going through hardship? Look, I think number one, we need to look at — everything is a mindset. Okay, so, when you’re looking at something and thinking, ‘Man, this is the worst thing I can ever be a part of. I don’t know how I’m going to get out of this’, all this kind of stuff. And I’ve seen this for over 20 odd years, there’s always someone in a worse position and they would die to be in your position. Perspective is everything, and the difference between going through a trial or hardship and going through something that’s insurmountable is mindset. So you may think to yourself, ‘If I do not become a doctor, I’m a failure at life’, then in your mind if you don’t get it, then that’s it, you’ve closed the door on everything. While someone whose on the slums, living on the rivers in Cambodia who has a meal once every five days, the least of their concern is that. A mother in Yemen who can no longer produce breast milk to feed her child, and the possibility of them both starving to death is around the corner, again, you can’t even draw comparisons there. So I think it’s about looking at the mindset of where you think you are, and why you’re there. I mean, no muscle grows without continuous work, a lot of damage, and repair. And so if you wanna grow, there’s no other way, it has to be through hardship, it just has to be the way to go. And I think that’s something that I’ve been able to see that, there are people that — and it’s very true that term, ‘it will either make you or break you’, it’s so true. But that’s mindset. The whole thing is about mindset. Beautiful. Okay, this question is gonna go a bit on a tangent. But, what is one quality that you love about yourself? And no mentions of anything negative, at all. I… okay. Yeah, how do I put this in words? Well, it’s very faith-based to me. In Arabic they call it Tawaqa, you know? So reliance, reliance upon God. Having complete trust that God’s plan is gonna come to fruition and it’s the right way to go. I love that no matter what obstacle or whatever’s going on, whatever the uncertainty is around the corner, I don’t care. You know what I mean? I love that I know that there’s a purpose for what it is. Man, and I’ve seen it. And I see it everyday. So I’m extremely lucky that I get the opportunity to see that, because I’ll tell you right now, for five days I didn’t sleep when that job closed down. How am I gonna provide for three kids and a wife, a mortgage, with no job? What am I gonna do, you know what I mean? And I just sat there and it was just amazing, people came out of the woodwork completely unexpected. Everyone I thought would be there for me wasn’t there, after all these years of serving this community you’d think someone would pick up the phone. You know what I mean? And it just came back in the craziest of ways, it’s like, I remember praying, ‘I don’t see a way out of this, God you have to show me what decision do I make? Do I do this business, do I bang bang?’ Yeah, and I was looked after. So I’m so, so lucky that my faith and my trust in my destiny is absolute. So good, so good. If you had one piece of advice for your younger self, what would it be? Hmm… I could do the cliche ‘don’t trust anybody’ [laughs]. I think for my younger self, don’t judge anyone. My early self had a problem with judgement. Policing makes you cynical, you know? You have to judge people to live for survival, don’t get me wrong, I mean your body tells you if you’re in danger and every time it did, it was right. But you can’t cast aspersions on what’s happening with people in the back when you don’t know their story. And I learned that later in life, I wish I learned that earlier. That’s so interesting, cos usually when I ask that question people are always like, ‘It’ll be okay, you know, life gets easier’, but it’s interesting how you’ve answered that question. Um, that’s pretty much it for today. But would you like to make any last comments? [Laughs] Um, look firstly, thank you. I think it’s very humbling to be worthy of an interview, number one. And I think it’s important for people that are listening to make sure they don’t become what society expects them to be. You know, that’s the take home message I’ve seen in this community. That’s what I tell students that I see whenever I do presentations. There’s an expectation of what people think you’re gonna be, teachers, principals, the wider community. And in this age of social media, and the fact that everyone now can have a voice — and many of them shouldn’t — your character will get attacked, people will map out for you what they think your future will be. They have absolutely no right to do that. And it’s very easy to succumb to the taking that, ‘Oh well, that’s what everyone thought I was gonna do anyway’. Nah. You create your own destiny. Thank you so much for that, and thank you for letting us interview you today. This is Stories of Strength, and we’re out.